This sweet, delicately flavored vegetable, related to onion and garlic family, has an edible 6-10 inch blanched, white stalk. The tough, strappy, green leaves should be trimmed away, leaving the pale green and beautiful white stalk. The dark green portion is usually discarded since it has less flavor. As the leek grows, this part becomes woody and very chewy. 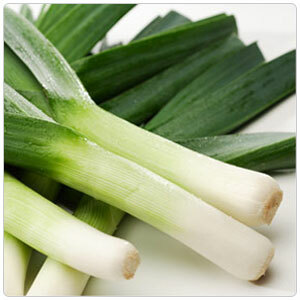 One of the most popular uses for the whites and light green stalks is for adding flavor to stock. Leeks must be washed thoroughly and should be trimmed just prior to use. Leeks keep best when wrapped or bundled in a damp towel, inside a plastic bag and refrigerated. Leeks are very versatile and can be used in stocks, soups, stews and braises; blanched and served chilled in salads, fried for garnishes, and grilled as a vegetable component.